And cookin' they certainly were. MD Jefford leading from the front with solos that cried out - "Follow that!" Nobody quite did although Elliott Todd, Bertie Marks (or was it Alex Utting on Watermelon Man? ), Ben Richardson and bass guitarist Hugh wotshisname? ran him close. Luke Gaul excelled on guitar just as he had done on bass guitar with Italics in the previous set whilst Harry Still is still something else on drums. Mercedes Phillips had a tantalisingly brief solo suggesting there was more to come from her in the future. This storming set was the finale of what was described as "Battle of the Bands". It wasn't a battle as such as I don't think there were any adjudicators around but, if there had been I think that the Bold Big Band would have won by a unanimous decision. 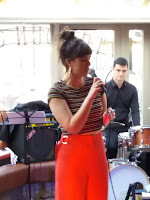 Prior to the BBB we had a set by Italics, a small group, most of whom were also in the big band, fronted by singer Ada Francis. 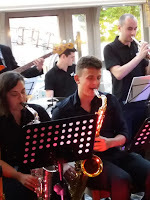 Ada Francis (vocal); Jimmy Jefford (tenor/alto); Ben Richardson (piano); Luke Gaul (bass guitar); Harry Still (drums). Ms. Francis is yet another jazz singer to grace the scene. If they all got together for a photoshoot, St James' Park wouldn't be big enough. Yes, there's a lot of them about, however, Ada has a head start as she's from the Ruth Lambert stable and Ruth only produces Derby winners (metaphorically speaking). It Don't Mean a Thing; Nature Boy and that most poignant of ballads, You've Changed, simply oozed with class - Your kisses now are so blasé, your bored with me in every way - The emotional content was delivered so effectively that it had me wondering which misguided guy had changed! Ada's final number was, paradoxically, Quiet Nights (Corcovado). The one thing you don't get at a student gathering are quiet nights and, sad to say, tonight was no exception the cool vocal drowned by the end of term bonhomie erupting from the bar area. Petite Bouche opened the show which is part of Newcastle University's Summer Music Festival. 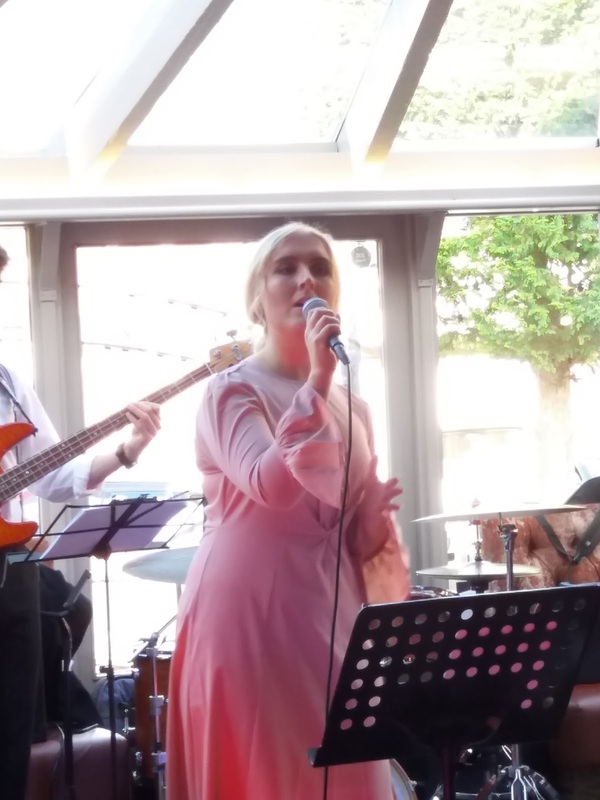 Megan Savage (vocals); Charlie Isaac (trumpet); Russel Sim (keys); George Comber (bass); Charlie Gordon (guitar); Zach Okonwke (drums). A more traditonal based outfit, their repertoire included a balladic take on The Sheik of Araby, Je T'aime, L-O-V-E, I Gotta Woman (! ), I'm Confessin' and Basin St. Blues all sung by Megan Savage who has a pleasing, period style, voice perfectly suited to the material in hand. Solos all round with perhaps the most impressive coming from drummer Zach particularly on the fast instrumental samba Brazil. Undoubtedly the band is a work in progress and one worth monitoring in future.